The scene was shocking. Thirty three dogs arrived in wire crates in the back of an open pickup truck bed. They had been on the road for nearly two hours in temperatures just barely over 30 degrees with cold rain pouring down on them as they made the terrifying journey to the meeting spot that the puppy miller had designated. The rescuers were appalled. The dogs were shivering, cold and completely panic stricken. As they were loaded into the van to complete the last six hours of their journey to HUA, rescuers turned up the heat, comforted them and wrapped them in blankets. They began to note nearly every dog had some medical condition. Teeth were horrible, mammary tumors on nearly every female, a mangled ear, possible pregnancies and pyometra infections of the uterus, spinal deformities, jaws deteriorating, eye and ear infections, long nails, painful skin from lack of grooming, and several who are grossly obese. Upon arrival at the shelter rescuers noticed that dear little Cindy Lou's legs were not working properly. She is currently undergoing evaluation at a veterinary hospital. First reports are that she has a mass on her brain stem. She only has half strength in her legs and often does not know where her legs are. The mass is causing mixed signals to her body which effects her colon and bladder. It is likely inoperable. 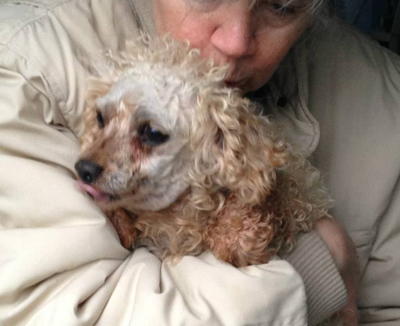 Despite the bad news, Cindy Lou is so happy to be rescued. She has been dancing around with her strange little gait and showering caregivers with kisses since she was rescued. The veterinarians say at this time she is not in pain. If not adopted Cindy Lou will be welcome to live out her days as a Sanctuary Sweetheart at HUA, where she will be warm, happy, loved and well cared for by the staff and volunteers. Dear little Gloria's jaw is so weak and deteriorated that it is barely holding together. She is at the veterinary hospital with Cindy Lou. Gloria also has a genetic defect, no doubt passed on to all of the puppies she churned out for sale at pet stores, that causes her jaw to be shorter than average and her teeth not to line up. It makes it hard for her to eat. Today she will have an operation to remove all of her teeth, which are painful, rotten and infected from the years of neglect. It will be precarious because her lower jaw is hanging on by a thread. fed cheap fattening food that was very bad for them. It is a wonder they are still alive with all the stress that the extra weight is putting on their bodies. Candy weighs in at 50 pounds and should be closer to only half of that. When John at HUA saw these poor girls he immediately made arrangements to move them into a large condo unit with big spaces inside and out to run and play. They are so obese that they may need to have some extra skin removed when they get down to normal weight. These precious thirty three dogs will have much to overcome as their bodies and hearts heal from the years of abuse and neglect they suffered at the puppy mill. Their team of dedicated caregivers and veterinarians will make sure that each precious soul is given every opportunity to thrive as they experience comfort and love for the first time in their lives. 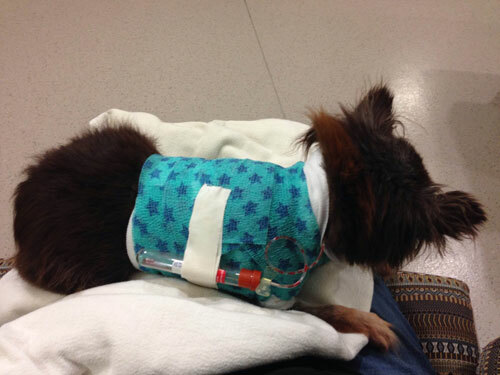 Their veterinary bills are anticipated to exceed $25,000. Without your heartfelt support we could not help dogs like Cindy Lou, Gloria, Candy, Brandy and their newly rescued friends. Your contributions help to rescue them from lives of misery and sorrow and build their bodies and spirits, giving them lives they never dreamed possible. Visit our Facebook page to see the pictures of the dogs as they were rescued and as they arrived at HUA. We will post updates as we learn more from the amazing veterinarians and caregivers who are working so hard to save their lives. Thank you for supporting the newly rescued puppy mill dogs. Your care and concern means the world to them. After months of recovery Juan is expected to survive. This dear little Chihuahua was rescued by Hearts United for Animals from one of the most filthy, horrific puppy mills in Nebraska. He had a sore on his side and his ribs were misshapen. Initially the veterinarian thought that Juan had caught his side on wires or sustained the injury from dog fights at the puppy mill. He has been on multiple types of antibiotics, but nothing was helping, the infection was becoming worse. This week Juan made a trip to the Iowa State Veterinary Hospital where it was found that his infection was from a contaminated microchip that the breeder inserted. It migrated and the infection spread throughout his body as the chip moved. The surgeons at Iowa State performed deep tissue surgery, removing a large amount of infected flesh. Juan stayed in intensive care there for several days. He has just been released and is staying with Erica, an adopter of HUA dogs and employee of the veterinary hospital. In addition to Juan's infection it was also found that he had three broken ribs from a blunt trauma injury he sustained at the puppy mill, veterinarians said either from being kicked or hit with an object. 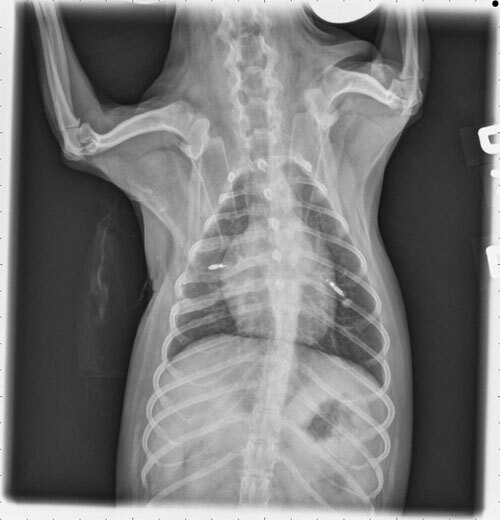 His ribs healed poorly and calcified making them twice the size that they should be. There is no way to fix it, it will be a permanent condition. His lung x-rays showed bright spots that veterinarians felt was from inhaling a chemical reacting agent at the puppy mill. That will also remain a permanent condition caused by neglect at the puppy mill. Despite all of Juan's issues he is one of the brightest, happiest, most adorable fellows we have ever met. He knows he is being helped and appreciates the support of the caregivers and volunteers at HUA and Iowa State. His caregivers describe him as sweet, innocent, and undemanding. He adores attention from the people. A soft stroke, a hug and a kiss mean so much to him. He has an amazing spirit to have endured all he did for so many years and still be so forgiving of humans. Although his body is damaged and broken, his heart is telling him that life is just beginning, and he is so happy about that. The smallest things mean so much to him; a soft bed to sleep in after years living in harsh conditions on filthy wire cage bottoms, good food and clean water, and most of all people who care deeply about him and express love and concern. He is finally able to rest peacefully and comfortably. Reports from Erica on Juan's first night at her home where he is staying for several days to finish his recovery were that he was sleeping comfortably next to her on the couch, enjoying watching his first movie, while having comfort and care. He was smiling with relief to have his burdens lifted and soul soothed. Juan will soon be back at HUA, where he will be available for adoption. Our wish for Juan is to find a wonderful home with a family who will spend every day adoring him, caring for him and helping him make up for all of his lost, desperate years at the puppy mill. 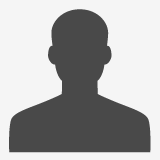 If you are interested in learning more about Juan please write to tera@hua.org. Contributions for his surgery and care can be made online at www.hua.org. Juan's story has struck us to the core and shattered our hearts. His fight to survive steels our resolve to help continue the fight against puppy mills and the pet stores who peddle the puppies of the sick, forlorn, abused and neglected parent dogs who are prisoners of their greed. Mountains of evidence have been presented to the county attorney and Nebraska Department of Agriculture, and yet nothing is done to shut down this house of torture. The abuse has been ongoing for years. The puppy mill is listed on the Horrible Hundred by HSUS, as well as a top offender by the Animal Legal Defense Fund. Nebraska's answer has been to strike deals with the puppy miller, downsizing her from 400 dogs to 300, then 200, and now hoping that she can care for less than 100. HUA's stance is that if she had only one dog she would likely not care for it properly. She has proven over and over again that the business of selling the offspring is all she cares about. The dogs should be seized and she should be shut down for good. For residents of Nebraska, voting counts. Knowing the candidates stance on puppy mills and if they will continue the same old dirty, devious ways of protecting the breeders and their buddies in appointed offices, or if they will have the integrity to do what is right by the dogs is particularly meaningful right now as November approaches. HUA and other animal welfare agencies cannot endorse candidates, but we can and do encourage you to conduct research before casting your votes. Please think of Juan and encourage your friends never to buy puppies from pet stores, and to help fight the legal and moral issues surrounding the plight of thousands of suffering dogs. Juan is just one dog, but he is one mighty little fellow who has a powerful story to tell regarding greed and corruption in this state. Collectively animal loving voters in this state are a huge voice, one that can effect change for the animals. Please help be a voice for Juan. Catherine was found out wandering. She was abandoned, starving and left to die. She was taken in by kind strangers who tried to nurse her back to health. Unfortunately she was very ill and the people who found her did not have the resources to care for her. When they called Hearts United for Animals for help they said that Catherine had not kept down food or water for at least five days. She was skin and bones. When she arrived at the HUA veterinarian's office they said she was at least 30 pounds underweight. She was treated for parasites and slowly reintroduced to food. As she was still struggling with gastrointestinal issues and making frequent trips back to the veterinarian's office for more tests, it was discovered that she was also pregnant. That was a terrible diagnosis for a girl who was skin and bones and still having trouble eating, but HUA staff members did everything they could to keep her going. She was moved to a foster home for round the clock care. During the last few days before she gave birth she became gravely ill and was rushed to Urgent Pet Care in Omaha where she spent the weekend on antibiotics and fluids for pneumonia and dehydration. 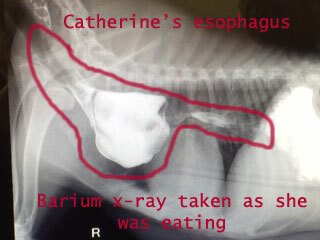 Specialists were consulted and additional x-rays were taken to find out if there was a deeper cause for her inability to keep food down regularly. 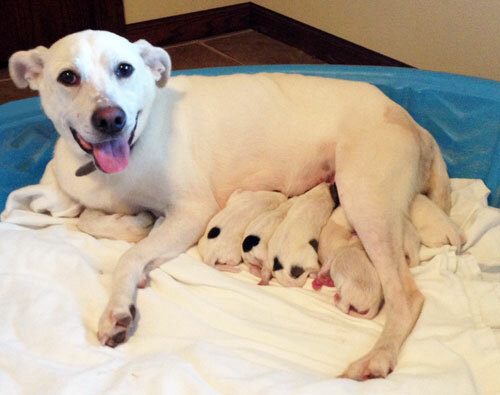 Just as phone calls were being made and x-rays were being sent around the country for review, Catherine gave birth to seven fat, happy, healthy little pups. Against all the odds they were just fine! The nutrition Catherine had been able to keep down had gone directly to the pups. As Catherine was starting to nurse her new babies, requiring even more of her precious resources, the call came in with a clue as what her main medical issue might be. A radiology specialist thought that her esophagus was constricted, resulting in food not passing easily. It was suggested that Catherine be fed in an upright position with special canned food blended with equal parts water. Her foster mom is feeding her every two hours and Catherine now is happy with the routine of putting her paws up on the table top and lapping the food out of the bowl. She also holds Catherine up in a vertical position for several minutes after each feeding to make sure the food has a chance to pass into her stomach. 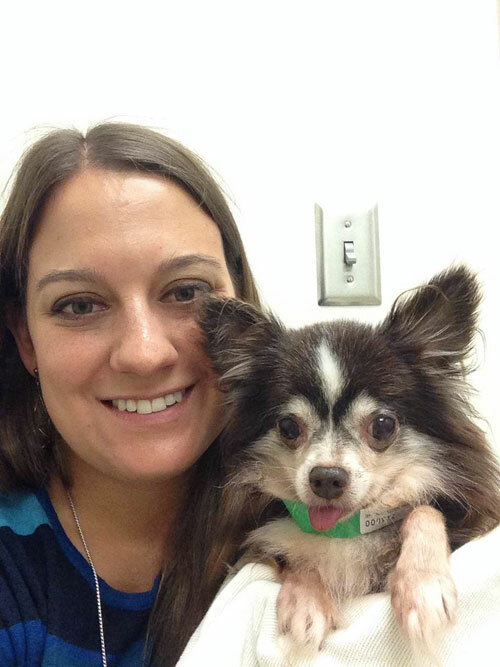 Last week Catherine and her pups made the trip to Omaha for more tests where it was determined that the esophagus constriction is indeed severe. When filled with food the upper part of her esophagus turns into the size of her heart and the part where the constriction is located is so small it is barely visible. It is like a funnel. Surgical specialists are reviewing her case to see if she is a candidate for an operation. They feel that it may be caused by a persistent right aortic arch, a rare genetic defect. Catherine is thought to be four years old. Most dogs do not survive this long with that condition. She cannot undergo more tests for definite answers until the puppies are weaned and her pneumonia is completely cleared up. The good news is that she has kept all of her food down for over a week. Because of the new feeding arrangement she should no longer aspirate food into her lungs, which is what caused her pneumonia. If Catherine is not a surgical candidate she will likely do fine with a special chair made for megaesophagus dogs (a condition similar to Catherine's). A company called Bailey Chairs 4 Dogs is already making one especially for her that they are donating at no cost. This will mean no more eating off of the table while standing upright or having to be held upright after she eats. We will keep you posted on Catherine's condition as we know more. We wish to extend our deepest gratitude to everyone who has donated to help Catherine and to the Bailey Chairs 4 Dogs company. Catherine's expenses have been and will continue to be high, including 6 cans per day of prescription canned food that she is on right now while she needs extra nutrients for herself and the puppies, and special supplements and antibiotics as well. Donations are still being accepted for her online by clicking here. If you are interested in adopting Catherine or one of her puppies please email tera@hua.org. They won't be ready to go for several weeks but they would love to have reservations lined up for wonderful homes! 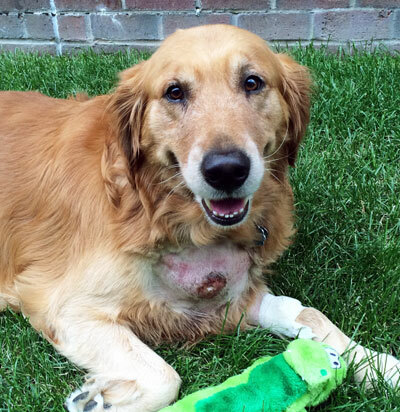 Bodie is a gorgeous, happy four year old Golden Retriever. He always had a small cyst on his chest/neck area and the veterinarian said it was no big deal. But two weeks ago it suddenly grew to the size of a baseball overnight. Bodie's temperature spiked, he wouldn't eat and was very lethargic. 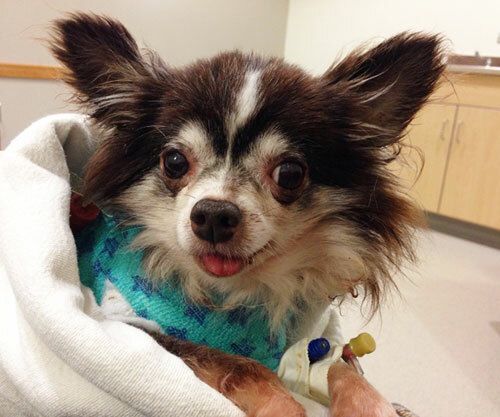 His elderly owners took him to an urgent pet care facility. His human mom is on disability and his human dad has terminal cancer. They only had $200 to their name. That would not even be enough to get Bodie through the night much less get him the ongoing care and operation he would need. They thought they were going to have to have him put to sleep that night as their only option to relieve his suffering. After the veterinarian recommended a call to HUA Bodie was soon started on an IV with fluids, antibiotics and antiemetics. Bodie spent a week in the animal hospital recovering from his infection. The cyst is on Bodie's jugular vein so the operation will be very delicate. He just started eating again and was released to go home. His family was so very grateful to have their boy back. He is one of the only bright spots in the lives of a dear elderly couple who are suffering so much. 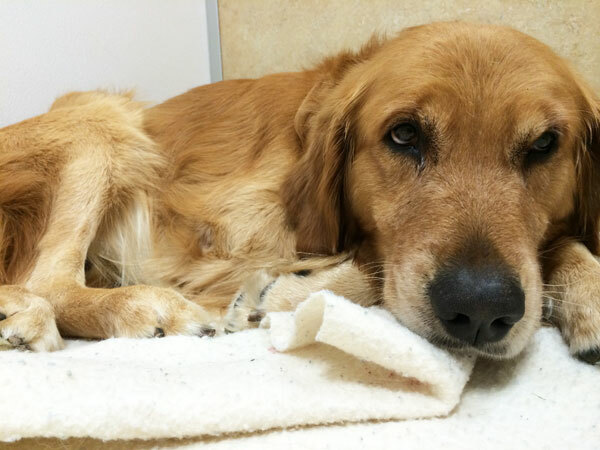 Bodie is not yet well enough for surgery. He will have follow up visits, blood tests and more biopsies before he is ready for that. A very skilled surgeon was found who will perform the operation when Bodie is ready. The costs are being covered by Hearts United for Animals. Updates on Bodie will be posted on our Facebook page. Donations for Bodie's care can be made online by clicking here or you can contribute through Bodie's t-shirt fundraiser that runs through July 10th by clicking here. 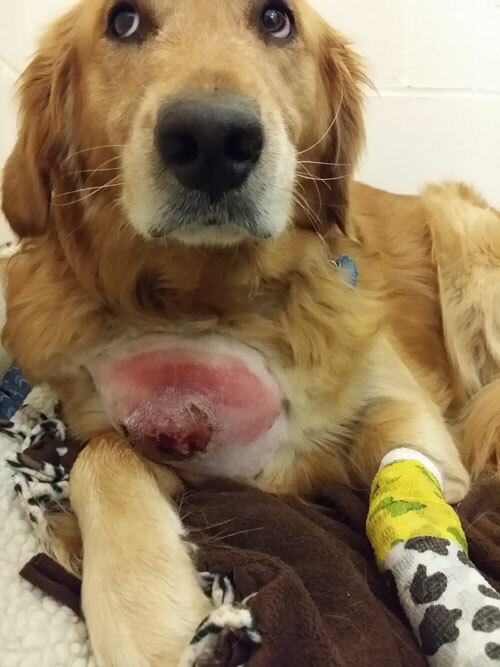 Bodie and his family send their deepest gratitude for your support that is helping to save Bodie's life. On May 29th, 2014, as a Hearts United for Animals supporter, you will have a unique opportunity to more than double your donation to help HUA ease pain and suffering for dogs and cats in need and help save lives. On May 29th, HUA will once again participate in Give to Lincoln Day, sponsored by The Lincoln Community Foundation. In addition to qualifying HUA for a portion of a $300,000 match pool of funds, donations made to Hearts United for Animals for this special giving day will also be matched dollar for dollar by The Gary and Mary West Foundation, resulting in donations being matched MORE THAN DOLLAR FOR DOLLAR. Our goal for the day is $150,000, double that of last year's event. Funds raised will be used to help save the lives of many more dogs and cats needing immediate emergency assistance. Please help us meet our goal by donating and spreading the word to your friends and family. You can set up your donation now to happen on May 29th by going to http://givetolincoln.razoo.com/Hua. It is automatically set up to run your donation on May 29th. Donations must be made through this site to qualify. For donations over $10,000 or for any questions or concerns please contact lori@hua.org. Dogs like June and her pups thank you in advance for caring about them and helping to save their lives. 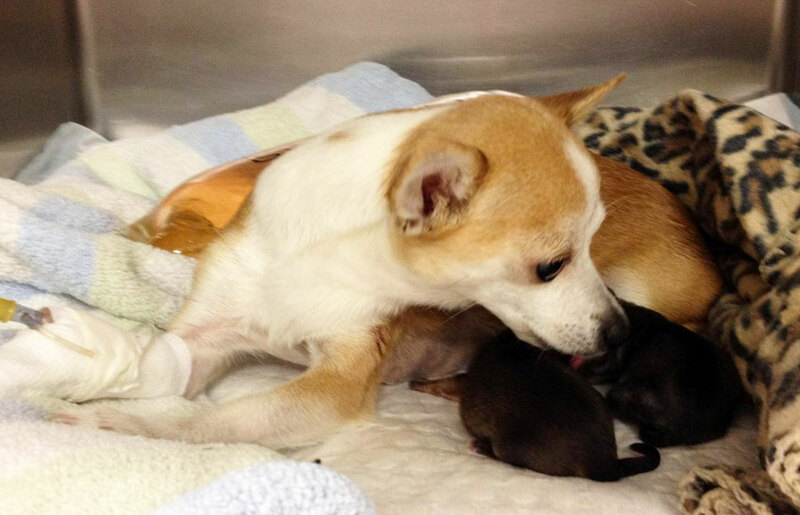 On the evening of Mother's Day, June arrived at an emergency animal clinic, weak and in shock. She had been having trouble giving birth. She had a dead puppy that was breach and could not be pulled out. Her family had no money for her care and she was left that way much too long. Hearts United for Animals received a call from the clinic just as tornado sirens were going off and the city was running for cover. After a quick "yes we will help", June was soon having surgery to save her life and the lives of her two remaining babies. It was touch and go and the surgeon had to work quickly, but June and one beautiful boy and one lovely girl baby made it through. Your donations help HUA to be able to say yes to saving lives like that of June and her pups on a moments notice. Please help June and her pups to pay it forward to other dogs and cats in need by participating in this special giving day opportunity to more than double the number of lives we can save. Your support means the world to so many dogs and cats who would otherwise perish without immediate assistance.